Originating in the crater of Mt Hood, the White River Glacier sits on the mountains south side, covering an elevation from 6,800 to 10,000 feet. It is the source of the White River, and lies between the Newton Clark Glacier to the east and the Palmer Glacier to the west. The approximate volume of the White River Glacier is 7000 acre-ft, and it covers an area of nearly 135 acres. During the winter, large amounts of snow from the south side of the mountain are transported onto the glacier from heavy winds, feeding it and somewhat hastening it’s retreat. 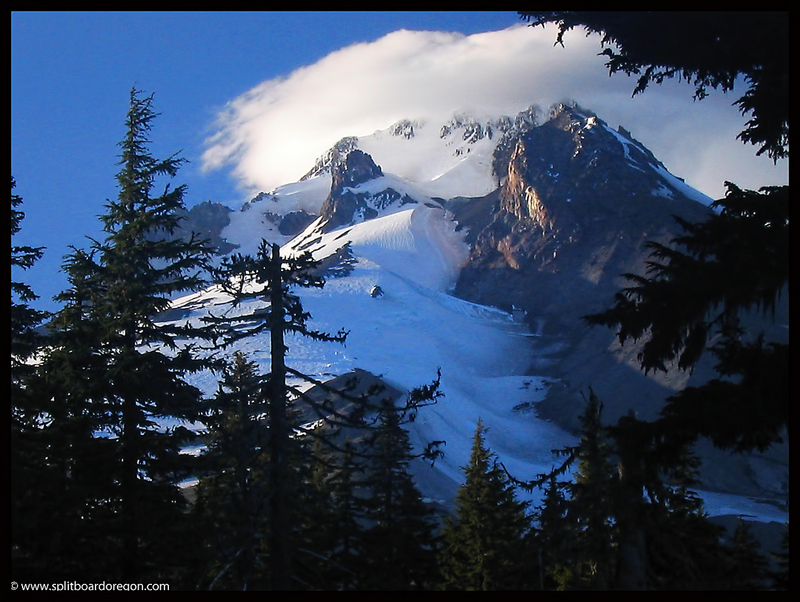 The White River was likely the first glacier on Mt Hood that was seen up close and personal by white settlers. In 1845, Joel Palmer and Sam Barlow followed their way up the White River to timberline while looking for a suitable route for wagon passage to the Willamette Valley. At the time, the only way to the Willamette Valley from The Dalles was to float down the Columbia River via two small boats that charged more for the ferry ride than the wagons were worth. Palmer and Barlow ultimately found a suitable route that passed near present day Government Camp, and Barlow later built the famed “Barlow Toll Road” to allow passage for other settlers. 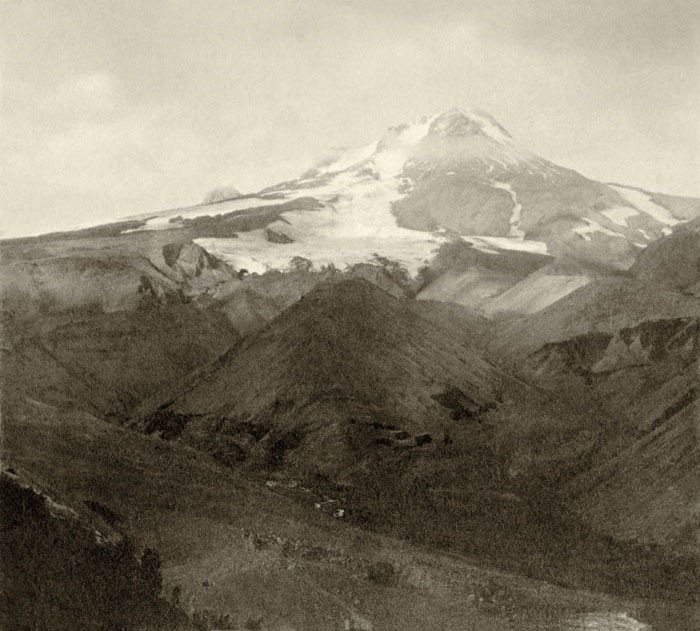 The glacier was first photographed in late 1800’s , and several photographs exist from around the turn of the century. The following photograph was taken circa 1873 by Joesph Buchtel, and was refinished and provided courtesy of Old Oregon. Sometime after the turn of the century, it is speculated that fumaroles opened up higher on the mountain in locations that contributed to the retreat of the glacier. 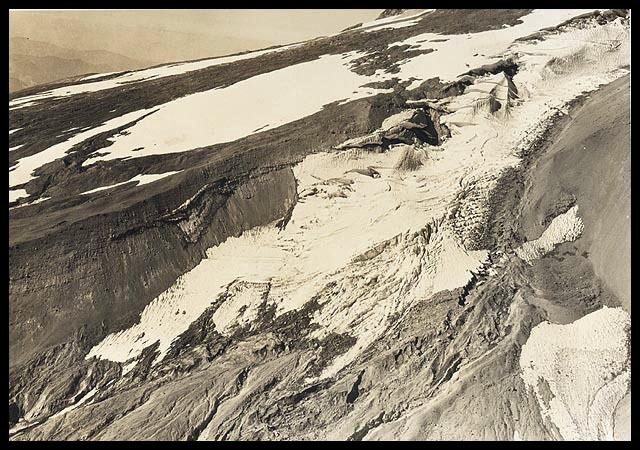 The below photo offers a comparison of the glacier over a 108 year time period. The photo on the left was taken by William Langille in 1902. I snapped the photo on the right in October of 2010. It is estimated that the glacier has lost 60% of it’s areas since the turn of the century. The following photo, taken by L.J. Bailey in 1935, is courtesy of the National Snow and Ice Data Center/World Data Center for Glaciology, and shows the White River from a different perspective. Note the Salmon River Glacier (now the Palmer Glacier) in the upper left of the photo. Bailey, L.J. 1935 White River Glacier: From the Glacier Photograph Collection. Boulder, Colorado USA: National Snow and Ice Data Center/World Data Center for Glaciology. Digital media. The upper White River Glacier has good skiing and snowboarding opportunity nearly year-round, but crevasse hazard does exist and caution is advised for any travel on or near the glacier outside the Timberline Ski Area. 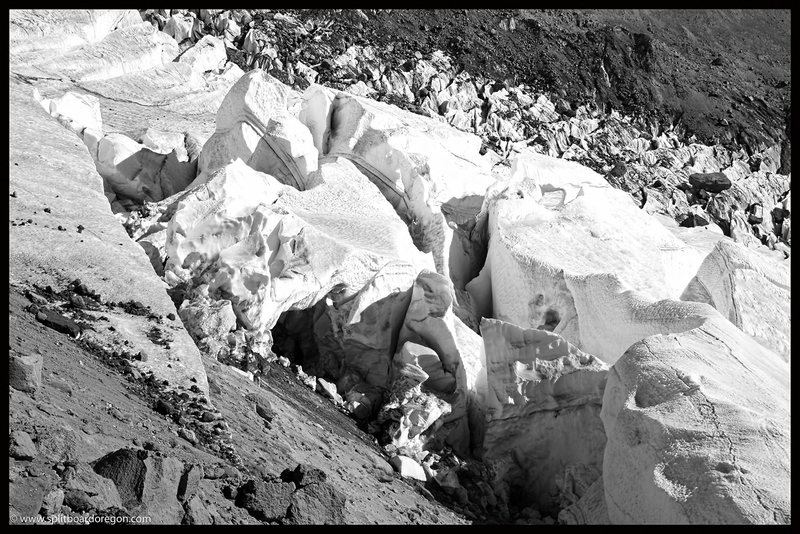 The lower portion of the glacier contains numerous crevasses and is a good place for crevasse rescue practice in the summer. Beware however, rockfall from the westerly ridge above routinely rains down on the ice and snow below. 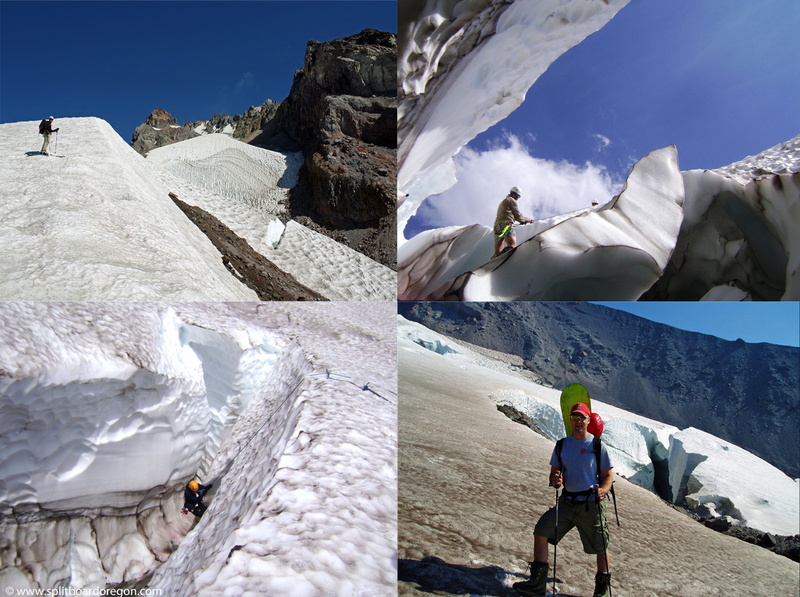 The below photo contains the following: upper left – skinning up the White River Glacier in September, 2010. Upper right – crevasse rescue practice. Lower left – crevasse rescue practice. 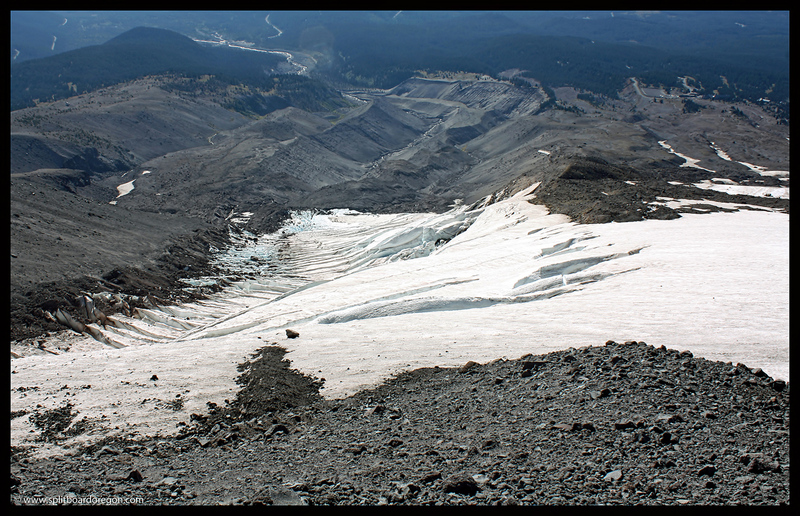 Lower right, hiking the glacier for summer turns in September 2006. The crevasses on the White River glacier really open during the later summer months and into fall, exposing the blue ice deeper down. The exploring opportunities are endless, and the area makes for some interesting photography, but as mentioned previously, rockfall danger is very apparent, especially on the west side of the glacier. The White River Glacier is one of my favorite places on Mt Hood, and with close access to Timberline Lodge, makes for an easy approach to view one of Oregon’s more interesting glaciers.